What if you could have the PERFECT bodybuilding training program mapped out of YOUR specific body type, designed in such a way that you were guaranteed results? 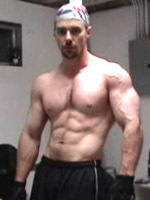 Let's face it... You made it THIS far on this site, so you have SOME interest in taking your physique to the next level. Now, imagine what it would be like to have the POWER, STRENGTH, and ENERGY you need to train ALL-OUT in the gym, with the confidence that you are making progress each and every workout. Can you FEEL your muscles contracting through every rep? Feel your muscles get harder and STRONGER. If you can see the image and feel that feeling of Raw Power, then you are just seconds away from actually getting those results you wanted for so long. You see... There's a RIGHT WAY to train for your body type and there's a WRONG WAY to train for your body type. I can GUARANTEE you that 99.97% of the muscle-building programs available are designed for hard-gainer men. This means only skinny guys will heed the results. My name is Karen Sessions and I've been where you are... I was also stuck with my dieting and training and became COMPLETELY frustrated from not getting ANY results, despite ALL the hard work I put in. You see... I started bodybuilding in 1988, putting in HOURS of weight training in the gym and closely watching my diet, only to be left at square one month after month. I even read ALL the popular bodybuilding magazines including Flex, MuscleMag, Ironman, Muscle & Fitness in hopes to unlocking the key to building strong muscles that I so desperately wanted. After YEARS of study, research, trial-and-error, working with top-level amateurs and Pros I was able to BREAK the Natural Bodybuilding Code to build muscle and shed body fat... And the changes that came after my SHOCKING discovery were nothing short of AMAZING! My journey of breaking the muscle gain / fat loss code was long and it was hard... but it WORKED and it worked FAST. Until now, no one on the outside has a clue about what I did to make such great muscle gains, while dropping body fat at the same time. I was receiving TONS of e-mails every day from men and women, asking me for diet and training advice, help, and programs. I would literally spend HOURS answering countless e-mails and PM's on forums. I finally gathered myself and decided to put my ALL my years of bodybuilding research and trial-and-error into an easy-to-read simple system to deliver the EXACT same results. That's right... I have Jam-Packed ALL my knowledge into this unique bodybuilding training program to ensure muscle growth in the shortest amount of time simply by applying the techniques suggested. This system is Iron Dudes. Users of Iron Dudes report INSANE muscle gain in RECORD time. My inbox is CONSTANTLY filled with satisfied customers thrilled with their immediate muscle building and fat loss success. Look... Just Because You Are Not Genetically Gifted Doesn't Mean You Can't Build The Body You Want. I'm Going To Share With You All The Diet Tips, Tricks, And Secrets To Gain Solid Muscle Mass, Burn Stubborn Body Fat, And Literally Transform Your Body In As Little As 12 Weeks! Did you know that there is a 20 minute window RIGHT AFTER your weight training session when your muscles primed for growth? Most people put 110% into their training, yet FAIL to Capitalize on this 20 minute growth window, and in doing so they NEVER make desired muscle or strength gains. In Iron Dudes I'll share with you how to QUICKLY and EASILY take advantage of this post-training growth window. The simple step of OPTIMIZING your post-training meal can BOOST your recovery to catapult muscle gains so fast your head will spin. This means Twice The Muscle Gains In Half The Time! Just think about it... 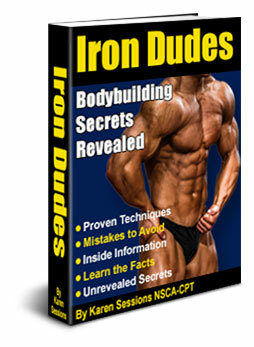 Implementing the concepts outlined in Iron Dudes you will have a dramatic impact on your body transformation success and will have you turning heads in just weeks. Just think about the jealous stares you will be getting from everyone! Are you thin and have trouble gaining muscle? If so, you are an Ectomorph, and luckily most muscle-building programs are designed with YOU in mind, BUT PRIMARILY your male counterpart. The problem with traditional muscle-building programs and the Ectomorph is, the diet is too high in calories and cardio is nonexistent. To make a body transformation, you will heed much better results with a diet BALANCED for YOUR body type, shape, and structure, and you can even BENEFIT from some gentle cardio from time to time. Do you have an athletic build and want capitalize on it? If you have inherited an athletic build you are among the lucky few known as the Mesomorph. Can you benefit from a muscle-building program? Of course, but you need the RIGHT ONE for your Specific Genetics. Many muscle-building programs aren't designed for you, so following them may leave you disappointed when it comes to the results you want. There aren't many, if any, programs available for you, UNTIL NOW. Now you can have the prefect outline to map out your diet to the letter, follow appropriate training suited for your genetic needs, and know exactly how to tailor cardio so you don't eat up that precious muscle mass you have. 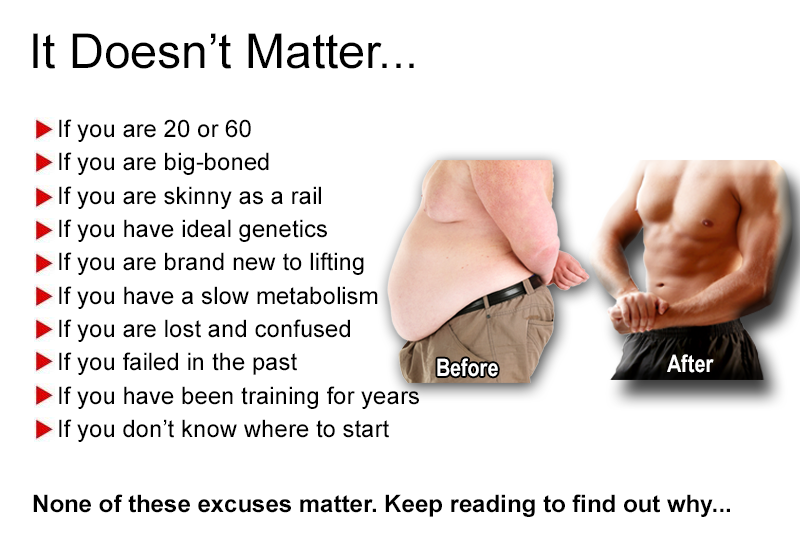 Are thick and gain weight TOO easily, yet want to transform your body? Until Now... I've worked with THOUSANDS of women of all body types and shapes and have successfully decoded the ideal muscle-building program for the Endomorph. 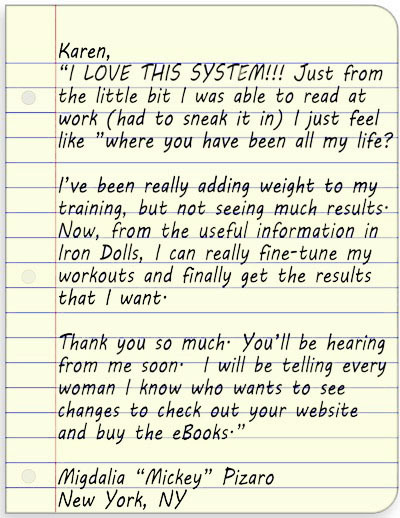 "I have thoroughly read through Karen Sessions blockbuster eBook ‘Iron Dudes’ and can’t help but recommend for its wealth of pure and simple unsurpassed training and nutritional information. 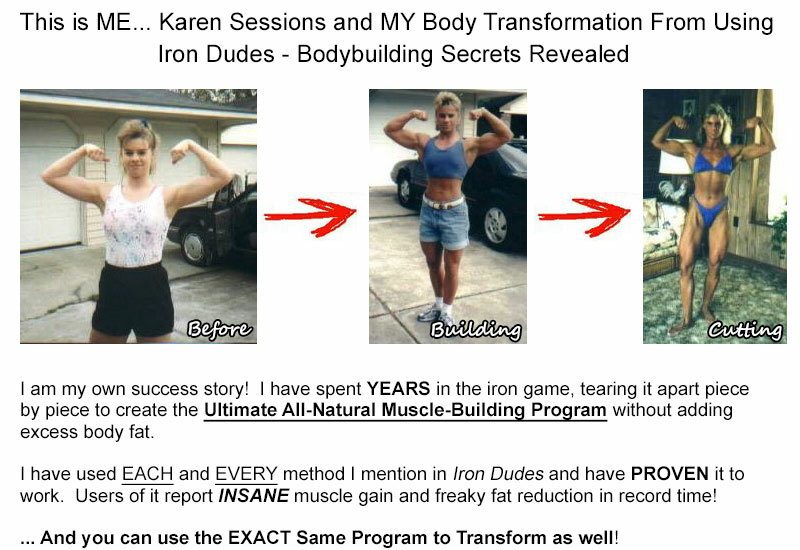 I have a tremendous respect for Karen Sessions expertise in the bodybuilding and fitness field and I enthusiastically invite all personal one to one trainers (who work with women) to purchase Karen’s no nonsense eBook ‘Iron Dudes’ "
You'd think who else is more qualified to teach body transformation science other than a successful athlete, who has done it all? In her book Karen teaches you nutrition, resistance training, resting, supplementation. And it doesn't stop there. She goes further to teach you things like how to get out of or avoid plateaus, and even how to manipulate your own hormone production for better, and desirable biological responses. Most of all, Iron Dudes is written in a language that we all can understand." 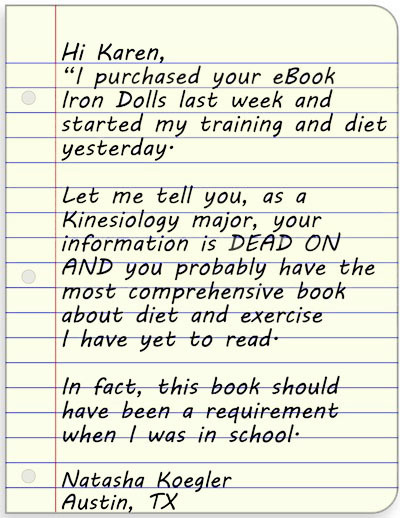 "If you truly want to maximize your muscle and rip the fat off your body, Iron Dudes is definitely a must-have book. Karen has put together a phenomenal resource tailored specifically to the unique training needs of women. She's got the experience, the know-how and a HUGE number of client success stories to back her up. Karen has an approach to training that closely parallels my own - get your results with intense and intelligent training, back it up with quality nutrition, and use supplements to enhance and the support the effects of both. Bottom line: follow Karen's advice and you WILL get results." "As a fitness professional and working out in gyms all over the world, I’ve seen it all! 3.) And it REALLY burns me up when I see male fitness trainers without a clue, trying to train WOMEN like they train themselves! The fact is, if you're a woman and you’re looking for a lean, tight body and not afraid of a little muscle along the way, you better be listening to someone who’s lived the training and has seen REAL results! Karen Sessions' "Iron Dudes" is the most comprehensive, step-by-step guide I’ve seen that practically hands you your new body on a silver platter(just add sweat and a few extra groans to make it look harder ;-). Bottom line...if you’re a woman who wants to secretly smile inside because you know that group of men you just passed are STILL WATCHING..."Iron Dudes" is the program that will get you there!" So you want the perfect body? The reality is that you have to work hard for perfection. Muscle definition doesn’t just appear magically. Fat doesn’t just burn away on it’s own. Your dedication and motivation is what will bring you that perfect body. That is what I learned when I read the eBook called Iron Dudes. The author, fitness expert and successful female bodybuilder Karen Sessions, focuses on muscle gains with 100% natural approaches, while really digging deep with proper nutritional facts. I liked how it offers knowledge for either beginners or more advanced bodybuilders. The eBook makes it very clear that it is important to not compare yourself to others but to accept the way your body performs and the results you see from proper nutrition and training. Iron Dudes directs individuals by using raw ingredients to build muscle. Sessions focuses on the quality over anything else. Using natural athleticism is the key factor when striving to reach goals. Having the right attitude will propel you pass any average person. The eBook pays specific attention to all aspects for one to achieve perfection. These aspects are proper nutrition, resistance training, prepping the muscles for growth with nutrients to manipulate certain hormones, resting for proper growth and using natural supplements to assist in growth and recovery such as creatine and glutamine. Other areas that I learned from in the eBook were about how to burst through muscle growth. Each muscle group was covered in-depth on how to effectively train. I also was interested to learn about carb-cycling for fat loss for when it’s time to diet down, while covering implement and manipulate cardio to ignite fat loss at the same time. I learned a lot from the eBook Iron Dudes! I can see that through experience and hard work, Karen Session’s understands how to build muscle and do it the right way. The eBook is primarily for the woman who want to build awesome muscle and strength, however it also covers the dieting aspect. That’s a great combination! I highly recommend this ebook for anyone that is looking to increase muscle definition and live a healthy lifestyle. The ONLY other thing you need is simple determination, and if you made it this far, you have it so let's get you started on your firstweek, shall we? If you are READY to take the bull by the horns and really build some natural muscle that will get you noticed at the gym, at the beach, and even on the competitive stage, you NEED this system. Hands down, there's no other on the market like it. 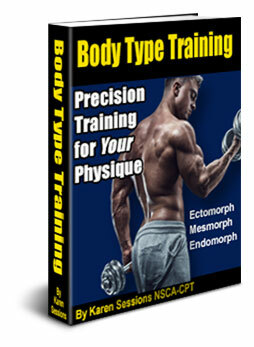 This Body Type Training eBook will identify YOUR Personal Body Type to you can start the proper training program designed for your unique physique. 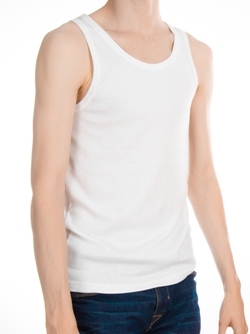 Finally, it doesn't matter if you are an Ectomorph, Mesomorph, OR Endomorph... Regardless of your personal body type and shape, you have a customized training program for YOUR specific body type and needs. 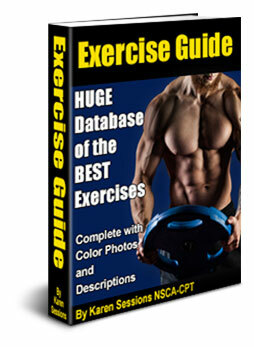 This is a HUGE Database of the BEST exercises to include in your training program. Each exercise from arms to abs has colored photos along with a complete description of how to execute each lift. It is organized so you can easily exchange one exercise for another if you are lacking equipment due to traveling or just want a quick change-up. Think I'm going to leave you hanging and provide training only? 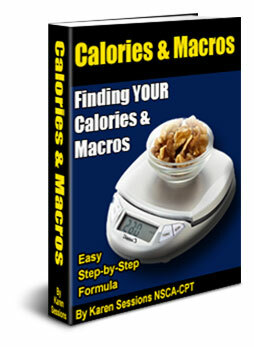 While that is the concept of the program, I have added an easy-to-follow Calories and Macros Guide so you can Quickly and Easily find the number of calories, protein, fat, and carbs you need to get your muscle-building job done with out added all that extra bulk weight that comes along with most muscle-building programs. No more lost in the numbers. I'll guide you all the way. Ya gotta eat if you want to build head-turning muscle. 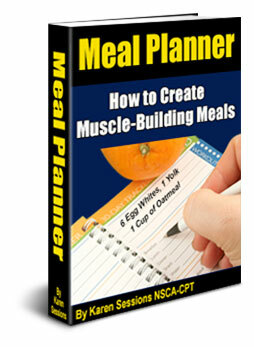 So, I created this easy to use Meal Planner so you can Quickly and Easily create your own meals to go with your muscle-training program. This is set up so you know exactly when to eat, how to place each macro nutrient in your diet for it's best effect. 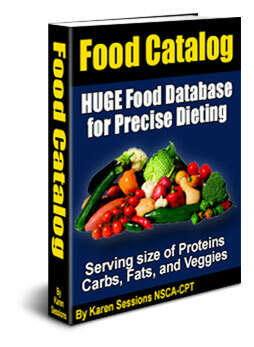 I'm also including a huge Food Catalog eBook so you can have first-hand access to all the best muscle-building foods as well as the energy-based foods, and the fat-burning foods. It's all listed here for you and this eBook works on conjunction with the Meal Planner and the Calories and Macros eBook to bring you the absolute BEST nutrition plan for your muscle-building goals. 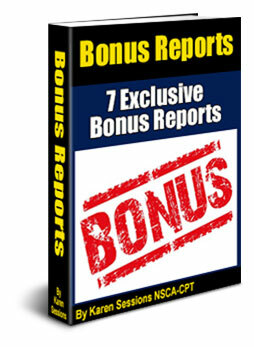 I'm also tossing in 7 EXCLUSIVE Bonus Reports that cover everything from controlling that nagging celluite to the secrerts to those shocking "before" and "after" photos you see all the time. Also included is a cool one-month diet plan that you can implement to get ready for anything in just 30 days and the truth about spot reduction. Is it real or just a myth... This report just might shock you. Lastly, I'll be sending you updated customized training programs routinely that are mapped out precisely for YOUR body type. This way we can keep your training progressive and fresh to constantly overstep any sneaky plateaus. That's right. I thought of everything and pulled out all the stops. It's time YOU finally transform no matter what your body shape is. How much would you expect to pay to receive 30 years of muscle building information, that others are unwilling to share, that actually WORKS on increasing your muscle mass easily and naturally, noticing results in just a weeks? Considering the amount of muscle you are likely to build by taking advantage of these bodybuilding techniques and secrets, certainly hundreds of dollars would not be unreasonable. But relax, you won't have to pay near that much to receive these bodybuilding secrets. 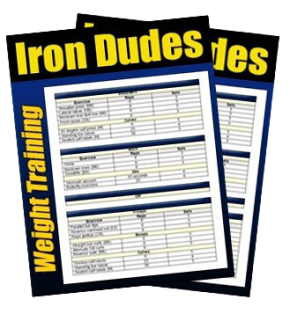 Iron Dudes Bodybuilding Training Program, Body Type Training, Exercise Guide, Calories and Macros, Meal Planner, Food Catalog, Bonus Reports, and Customized Training. 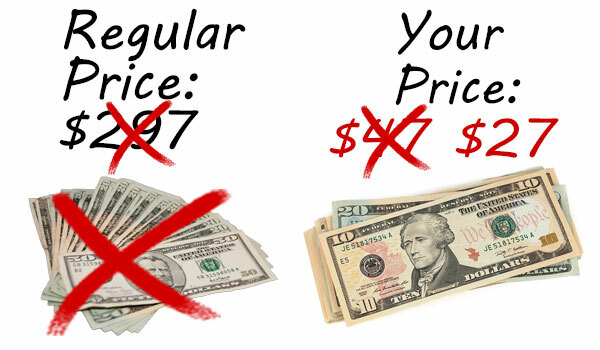 A value of $400 and the regular asking price is $297. Yep, you read that right. You will only pay $27 to receive my incredible bodybuilding training program to boost muscle gains and strength in record time. But, you must hurry... This special introductory offer will not last long. This is much too valuable and in too much demand to keep it at this ridiculous low price! © Iron-Dudes.com 2019 and Beyond. All Rights Reserved.